Birds can be some of the most damaging of wildlife in North Carolina. Because of their nesting habits birds can find their way deep into cracks and crevices on your home. Dryer vents, bathroom vents and overhangs can be some of the most popular places for birds to inhabit. It is common to find years of bird guano (droppings), feathers, nesting material, dead birds and eggs wherever birds are roosting/nesting. Early removal and exclusion is a must to prevent prolonged damage to property. 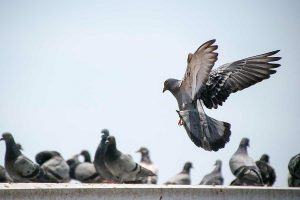 Birds such as pigeons, starlings and sparrows can inhabit overhangs and protected structures, using these as roost sites. Because these areas can be so large, bird spikes and netting can be options to eliminate roosting sites and areas.